Spend some time observing a spider colony and you might feel as if you've stumbled on into an arachnid junior high. Social spiders, such as Stegodyphus dumicola, live in large colonies of up to 2,000 arachnids. As they skitter through their nests - sometimes in giant, tree-enveloping webs - certain spiders are more likely to exhibit bold or shy characteristics than others. It's as if these spiders develop personalities based on "social niches," German and American researchers say in a new study in the journal Biology Letters. As an animal's social circle expands, he is more likely to have the opportunity to develop a specific personality, according to the scientists. "If you live in the same group for a long time, with the same individuals, you are able to specialize in your own niche, and therefore avoid conflict with other group members," study author Andreas Modlmeier says to Live Science. Among familiar members of a colony, a Stegodyphus dumicola spider appears to act differently than when she or he is surrounded by strangers. To test shyness or boldness, the researchers puffed air on spiders. Upon feeling the breeze, spiders would freeze in place as if in defense. When unfamiliar arachnids were close, almost all spiders acted shy, slowly relaxing. But having nearby friends meant spiders could return to normal in line with their personalities - bold spiders, for example, spent less time frozen, whereas shy spiders remained still. 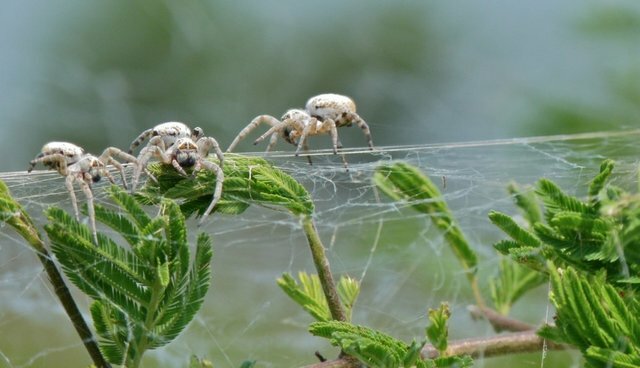 These spiders aren't the only social animals who can develop personalities. In a 2012 study, biologists at the Amboseli Trust for Elephants split elephants into four groups: "leaders, the gentle giants, the playful rogues and the reliable plodders," as the Telegraph puts it. Scientists have also attempted to find personality in hermit crabs, to varying degrees of success. And, of course, there are pets with personality. The American Society for the Prevention of Cruelty to Animals ascribes "research-based" personalities to the cats and dogs in its shelters. Though veering into anthropomorphism at times (a "Goofball" is a "glass-is-half-full kind of dog"), the ASPCA says that reporting the disposition of its dogs and cats leads to more adoptions and fewer returns or euthanized animals.